Saint Patrick’s Day or the feast of Saint Patrick is a famous religious celebration held on March 17 in Ireland. It was made an official Christian feast day in the early 17th century by the Catholic church. The feast is a commemoration of Saint Patrick and the arrival of Christianity in Ireland and a celebration of the heritage and culture of the Irish people. Saint Patrick was a Romano-British Christian missionary and bishop in Ireland during the 5th century. What people know about Saint Patrick nowadays came from the “Declaration,” allegedly written by Saint Patrick himself. It is believed that he was born into a wealthy Romano-British family, his father was a deacon and his grandfather was a priest. According to the Declaration, he was kidnapped at the age of sixteen and taken as a slave. He worked as a shepherd for 6 years and that’s when he found God. According to the Declaration, God told Patrick to flee to the coast where a ship was waiting to take him home. After making his way home, he became a priest and converted the pagan Irish to Christianity. He died on March 17. Over the centuries, he became Ireland’s foremost Saint. 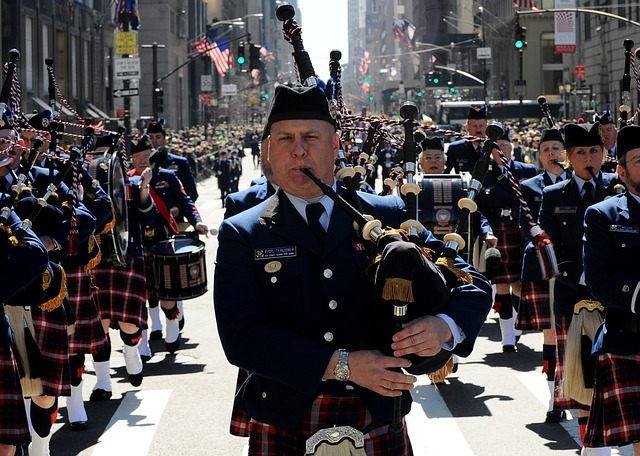 Generally, Saint Patrick’s Day is celebrated with public parades, festivals, ceilithe (Irish traditional music sessions), and the wearing of green attire or shamrocks. Formal gatherings such as banquets and dances are also held but is no longer common these days. Famous landmarks lit up in green during the feast. The feast is also declared as the “Irish language week” in Ireland, in promotion of the Irish language. Christians attend church services and the Lenten restrictions on eating and drinking alcohol is lifted for a day. “Wetting the shamrock” or “drowning the shamrock” is a popular tradition especially in Ireland. After the celebration, a shamrock is put into the bottom of a cup which is then filled with whiskey, beer or cider. It is then drank as a toast. The shamrock would either be swallowed with the drink, or be taken out and tossed over the shoulder for good luck. On Saint Patrick’s Day, it is also customary to wear shamrocks and/or green clothing or accessories. It is believed that Saint Patrick used a shamrock, a three-leaved plant, to explain the Holy Trinity to the pagan Irish that is why shamrock and the color green has long been associated with the celebration. Nowadays, Saint Patrick’s Day is observed around the globe – Great Britain, Canada, the United States of America, Argentina, Montserrat, Russia, Switzerland and Asian countries like Japan, Malaysia and South Korea, have had their own ways of honoring Saint Patrick. This is really informative. Though, I don’t think this is really celebrated that much here in the Philippines. I wonder if how did his grandfather who is a priest impregnated someone? Isn’t it priests practice celibacy? I’m half Irish, so I always wear green on St. Patrick’s Day. My mom used to make corned beef and cabbage when I was growing up for the holiday. But I’ve never heard of drowning the shamrock! Perhaps I’ll have to try it this year! Whenever I hear about St. Patrick, I always feel like it looks like Christmas day.. Not only because of the color green, but the festivities and happiness it scatters to people. To countries like us, even if we don’t celebrate it, whenever we hear about St. Patrick, restos and malls will surely have discounts or promos. We dont have this celebration in the Philippines but we have similar celebrations. It looks fun and people seems to participate it. I saw a documentary once about St Patricks Day in NGC and it’s a very interesting activity. I’m not big on festivals like this because I personally don’t like big crowds. This tradition is also not celebrated by my family or anybody close to me so I haven’t really celebrated it myself. It is also not celebrated in my second home in Denmark. I’d love to see a parade once though just to see how I would feel about it. Well, this is some new information completely. I have never known anything at all about this festival at all. It does look like a lot of fun and the involvement of people is commendable. I never really heard about this celebration. Can you believe that? I was growing up in the Netherlands and we are so close to Ireland, and still we don’t celebrate this. Unbelievable. I love to see your blog however, makes me feel like I was there and now I know what st patricks day is all about. I love the traditional clothes and the music. It has something magical.